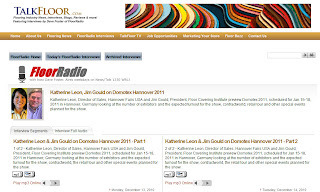 Last week, Jim Gould and I spent time with Dave Foster from TalkFloor Radio discussing DOMOTEX 2011. Our conversation became a two part interview which aired on Monday and Tuesday, December 13th and 14th, 2010 on TalkFloor Radio. It's also available on TalkFloor.com. Jim, Dave and I spoke about several of the special events that will be taking place at DOMOTEX 2011- which takes place January 15 through 18 - including the VIP Retail Tour on Monday, January 17th, CONTRACTWORLD, Souk Deluxe and FloorForum. Katherine Leon, Director of Sales, Hannover Fairs USA and Jim Gould, President, Floor Covering Institute preview Domotex 2011, scheduled for Jan 15-18, 2011 in Hannover, Germany looking at the number of exhibitors and the expected turnout for the show, contractworld, retail tour and other special events planned for the show. Each segment lasts approximately 13 minutes. 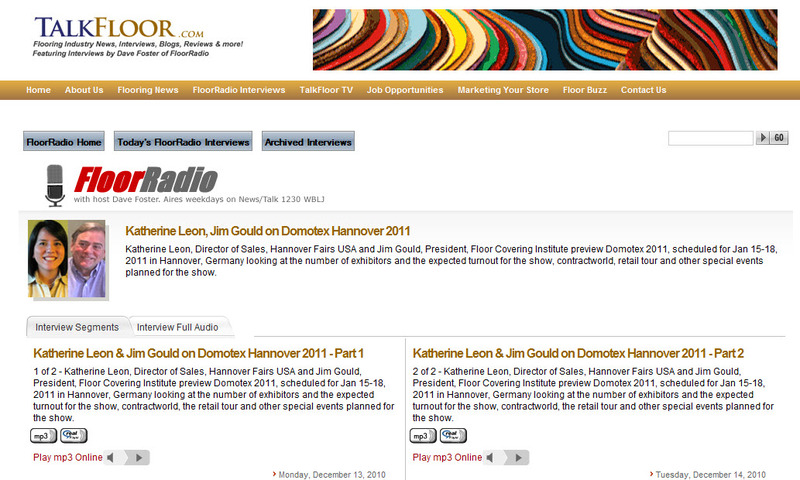 To access the recordings, click on Katherine Leon, Jim Gould on Domotex Hannover 2011. Thank you, Dave, for a terrific opportunity to talk about DOMOTEX 2011. We are excited about a great event next month and hope to see you there.